Appearance: Quartzite with blue background colour and random multi-coloured movements, including browns, oranges, reds, bronze and nuances of green. 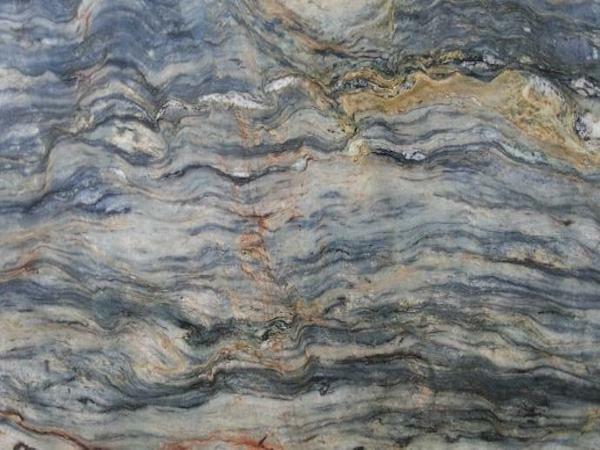 Properties: Geologically a quartzite, Blue Fusion has excellent properties, including high abrasion resistance, moderate absorption rate, minimal acid sensitivity and frost resistance. Multi-colour movement is typical of this quartzite and occurs regularly also within a slab. It is recommended to seal this stone to extend its longevity. Use: Due to its excellent properties Blue Fusion quartzite is suitable for all internal and external uses, including countertops and flooring in private and public environments, even with high pedestrian traffic. Projects: Bluebird restaurant, Chelsea (London).